Which white would work here? Hi everyone! I’m looking for some paint color advice. Our house is a 1950s queensland house with high ceilings and VJ walls. 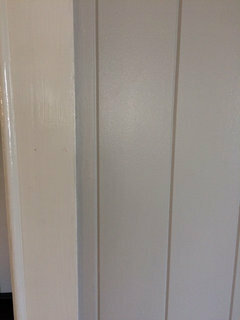 We have been slowly painting and our chosen wall colour is Dulux Dieskau. 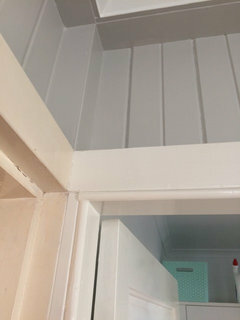 We have also painted our ceilings using just a flat white ceiling paint - they have all come up really nice. But - we have come to paint our lounge and it is the only room with a picture rail so we thought we would try something different. Also this room doesn’t get as much light as other rooms. We painted the picture rail and above using the ceiling paint but I think it looks cold and the VJ features are lost in the blandness. Is there another ‘white’ that would work better here? Or would a semigloss improve the look? 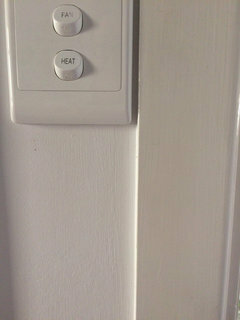 If we chose another warmer white would we have to paint the ceiling that same colour? We are also thinking if we change to a warmer white we would have to carry this through to door frames, windows, skirting boards etc when we come to paint all the trims. Is this the case? I don’t mind a more antique white given this is an older style home and to warm up the dieskau but the starker whites also look nice against the dieskau usually - just not in the picture rail! I also tried ceiling paint about picture rail and was very surprised how terrible it looked. I'd try a 1/4 tint of your wall colour. Both similar enough and different enough for the look you're after. Thanks @bigreader! I was very surprised. Do you think the stark white colour will look equally as terrible if I use it on trims? Thanks - not a bad idea and one that I hadn’t thought off! That’s why I love his forum! For the trims I'd look at Dulux Natural White. Try some and let us know what you think. We can suggest darker and lighter. Thanks to both of you for your suggestions. In the pic you can see part of a door trim. It is white but a little more antiquey - and quite yellow with age. I think it might be better to stick with this type of colour. 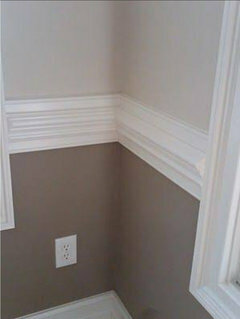 A few years ago we had a painter paint our bathroom and he did do the trims. They might be dulux natural white but I can’t remember. In these pics you can the new trim colour -against the dieskau in first pic. Against old trim colour in 2nd pic and against Dulux white on white wall colour in third pic. Does this look like natural white? If it is I think it looks nice against Dieskau. I think the 1st & 3rd white trims look best. 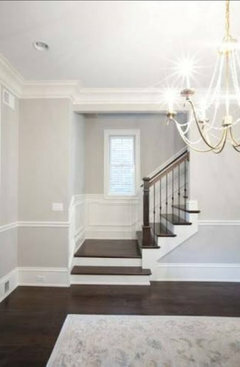 I also think Cipriano's suggestion re painting pic rail darker grey would look dramatic & gorgeous. Agree, darker grey for the picture rail. Thanks everyone. 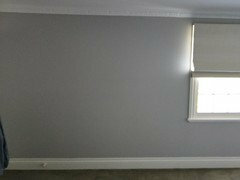 If I did the darker grey for picture rail do you think I could leave the wall above it as it is? Or change to a different white? 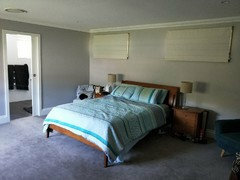 We just painted our bedroom the same colour, with ceiling white on the ceiling and I used vivid white for all the trims. It's a fairly well lit room with a mid-grey carpet. The contrast with vivid white is a very crisp look. I really wanted to eliminate the existing warmer/yellowy white trims against the grey as I felt it dulled it down, at least it did in our room. It is a lovely calm colour, great pop with the vivid white and I love it every time I walk in the room. Will post a pic later today. Agree with comment to go quarter strength your wall colour as an option. 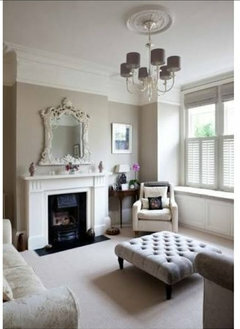 Crisp white for trims etc really does freshen things up and makes changes later on much easier in terms of wall colours. Another option is just take the existing wall colour right up and paint the trim a slightly lighter variation of the wall colour if you want to make it a feature. Wallpaper with a small pattern would look amazing in similar tones to paint on the wall. Unsure about how well it would cover the paneling. Reb, our house is very old too but a different style to yours, cornices and high skirting boards in every room. I wondered about vivid white too but took the plunge. The paint just makes it look clean and fresh, definitely feels updated without being jarring. Awesome. Exactly what I needed to hear. Thanks! Sorry for the poor quality pictures but you should get the idea. The blinds will be going too in favour of white plantation shutters. Hope that helps and good luck! Thanks for the pics. Looks awesome. It is a great color isn’t it? Love the space you’ve got there. Very nice! Thanks Jo! They are quite high ceilings but you’re right - it is a shame to make the room look lower. I have only undercoat on most of the room at the moment and I’m lovely the height that it creates with just the one colour. Maybe I should just stick with one colour or a lighter shade like you’ve suggested. Would you suggest doing the rail itself the same lighter colour or keep it white. Very interesting that by painting above the rail white like the ceiling gives appearance of lower ceiling. Makes perfect sense. 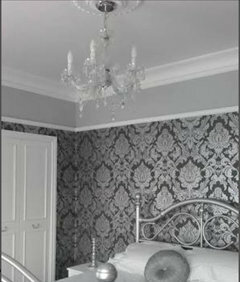 I have to agree with advice to paint below & above the pic rail the same colour of grey, and the picture rail a darker grey. I believe that will look amazing. Would these concrete finishes work in our kitchen? Which white do you like better?! 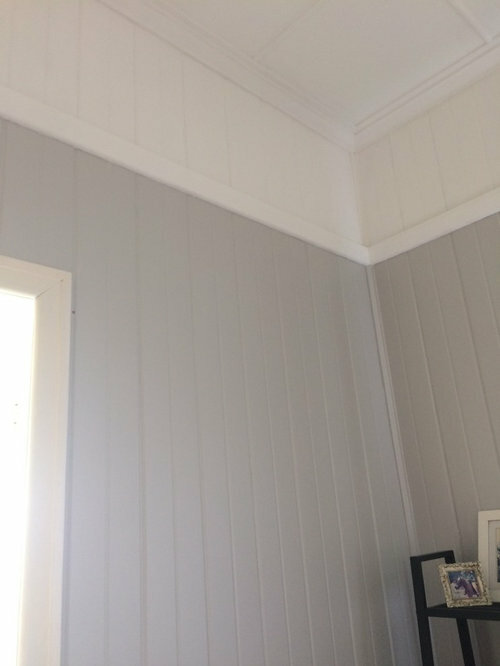 Timber ceiling - which white wall colour ? Which white paint to use...?